In the July 2007 issue of New Mexico Magazine, Michael Clark's work is featured in an article entitled Focus on the Extreme: The Photography of Michael Clark. The article, written by Steve Larese, details some of Michael's more harrowing adventures and dispels several myths about being a professional photographer, especially in the adventure genre. The six-page layout also contains a nice set of images shot in New Mexico and one portrait of the photographer at work while shooting images on assignment for Adobe Photoshop Lightroom in Moab, Utah. The teaser in the table of contents reads: "See the heart-stopping action shots of Michael Clark of Santa Fe, New Mexico, and learn how this avid climber made the journey to become one of the country's top adventure photographers." And the opening few paragraphs set a super-hero tone: "Whether it's photographing a mountain biker launching off of a 40-foot-high cliff, kayaking through boiling Class IV rapids or rock climbing with nothing but 200 feet of air between himself and oblivion, for Michael Clark, it's just another day at the office." "Santa Fe-based Michael Clark has made a name for himself in the world of extreme sports by capturing beautiful, death-defying shots of athletes pushing the limits of their physique and, some might argue, sanity. If you've ever breezed through any climbing magazine, Bike, Men's Journal, National Geographic, or have seen ads for Patagonia or other outdoor sports companies, chances are you've seen Clark's work. 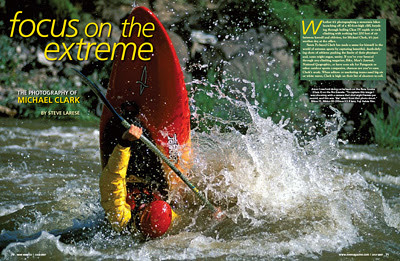 When editors or marketing teams need big air or whitewater, Clark is high on their list of shooters to call."